Agnes Igoye is a senior immigration officer and training manager in the Government of Uganda’s Ministry of International Affairs, where she provides expertise on migration issues and human trafficking to various local and international organizations including the United Nations Development Program, United Nations Office on Drugs and Crime, and the International Office for Migration. Igoye holds a bachelor’s degree in social sciences and a master’s degree in sociology from Makerere University in Kampala. 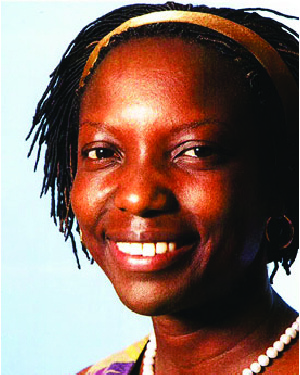 She earned a Postgraduate Diploma in management from the Uganda Management Institute and was a 2010-2011 Humphrey Fellow of the Humphrey School of Public Affairs. In 2011 she was selected to participate in the Clinton Global Initiative, an annual meeting that brings together heads of state, Nobel Prize laureates, non-governmental organizations, and major philanthropists to discuss pressing global challenges. Igoye is the founder of numerous organizations designed to improve the lives of women and children worldwide. Her projects include the initiative “Huts for Peace,” which constructs shelters for women whose homes were destroyed in war-torn communities, and “Coming Home,” a rehabilitation center that provides assistance to orphaned children, some of whom were abducted and trafficked by the Lord’s Resistance Army. In addition she has trained thousands of law enforcement officers worldwide to bring attention to key migration and human rights issues. Igoye has stayed connected to the University of Minnesota by mentoring Humphrey School students through the Global Mentor Program. She has also served as a resource to students interested in Uganda or her work, and participated in the selection of the 2012 and 2014 Fulbright Humphrey Fellows. She has worked with the Minneapolis organization Books for Africa to send thousands of books to Kampala to encourage literacy education. In naming Ms. Igoye as a recipient of the Distinguished Leadership Award for Internationals, the selection committee cited her inspirational and active leadership on human rights and on behalf of marginalized communities and her bright future in Uganda and worldwide.